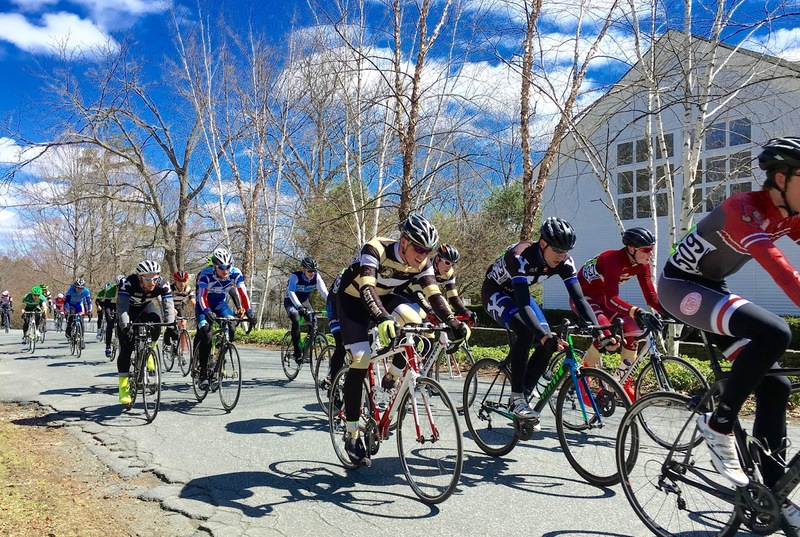 On Saturday, our friends at Dartmouth and UVM welcomed eleven Bulldogs and the rest of the ECCC to their campus for the start of the aptly named "Hell of the North" race. The four-race weekend took us through Dartmouth's campus for an individual time trial and a criterium, followed by a team time trial and a road race on Sunday just south of the UVM's campus in Charlotte, VT. The team also had the pleasure of welcoming Coach Hunter Pronovost from CCNS to the Dartmouth races. Hunter was instrumental in our warmup and pacing efforts in the individual time trial and coached us through our crit races. This 2.7 mile course started up a modest, yet tactically significant climb before rolling through the heart of campus. Racers made their way to a stretch of slightly downhill open road before a sharp right turn and a final climb over 8%. Matt Ampleman, Michael Moore-Jones, and Brian Drollette started the day in the Men's C field, covering the course in just over 9 minutes and good for 25th, 26th, and 12th, respectively. Following the C's was the Men's D's, led by Jordan Bravin and first time racer Jackson Salovaara. Jordan's passion for the world's best aerodynamics paid off, as he won the race by over four second on the course. Jackson came through shortly after, placing 11th in his debut. The Lady Bulldogs, represented by Liz Eldridge and Lexi Abel, were up next in the Women's D and C races. Liz got over her numbness from the cold and rode her way to a 12th place finish in the D field while Lexi placed 9th in the C's. Michael Landry and Michael Grome wrapped up the ITT in the B and A fields. Landry, aero as ever on his steel-framed monster, absolutely crushed the course in 7:52.14, good for first in B and the fourth fastest time of the day. Grome made his way through the course good for 11th in the fast and furious A field. 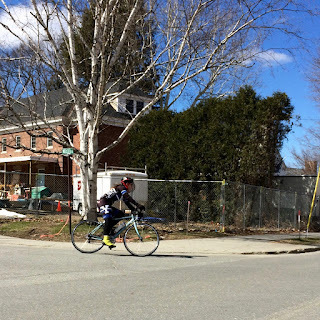 The criterium consisted of a 0.75 mile course with three tight turns and one slight uphill before finishing on a wide and open straight along Dartmouth's "Frat Row". Jordan and Jackson lining up for the start of their D crit. Jordan and Jackson kicked off the festivities in the D race. Jordan took a few pulls on the front while Jackson sat in the pack and studied the course. Their efforts paid off at the end, as Jordan sprinted to a third place finish and Jackson crossed the line for a solid 8th! 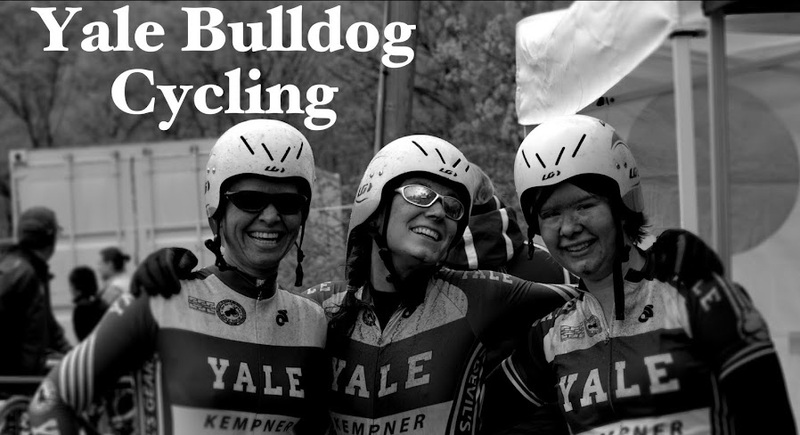 That's 9 more omnium points for the Bulldogs! In the C field, Matt and Brian worked the front of the pack while MJ sat in the middle of the 73 person field. Brian took a mechanical pit stop with 10 laps to go due to a collision with another rider, but was able to jump back in the main pack for the remainder of the race. On the final lap, a Harvard racer on the front took the second to last turn a bit too fast and slid out. Brian, 5 spots back, was forced off the road to avoid colliding with the downed rider while the majority of the pack raced on. Matt stayed upright and crossed the line with the main group. Lesson learned: anything can happen in a crit! Liz pulling the field in her Frat Row Crit. Liz, in the Women's D field, had a solid race and even miraculously managed to not run over anyone with her bike. Lexi also rode a strong race, but was pulled with a few laps to go. Landry took home yet another win in the B crit as he smashed the race to bits with his tactics. His plan was to stay at the front, take the turns hard, and string the field out. The strategy paid off as he rounded the final turn and sprinted to a narrow victory over fellow racers from UMass Amherst and Army. Way to go Michael! The final race of Day 1 was Grome's A race. He found himself in great position near the front of the pack for the majority of the race. On the final lap, a gap opened up on the outside of the lane on the climb and he worked his way up the pack. His plan to jump on the wheel of a Syracuse and KMS rider as they rode on fell short, as the KMS rider's foot unclipped right in front of Grome and slowed things down. He crossed the line mid-pack in the fastest race of the day. The team time trial course was a supposed-to-be-8-but-actually-10 mile course in a clockwise loop with nearly 1,000ft of elevation gain. The Men's C team of Jordan, MJ, Jackson, and Rafi Bildner took the first hill easy, making sure to not go into the red too deep early on. They played a game of cat and mouse with Dartmouth, as each team passed one another a few times on the course. Their finishing time was 30:14, good enough for 7th. Then the women took turns pulling one another in the D field. Lexi tackled the hills while Liz kept the pace on the flats and downhills and their efforts paid off for a second place finish! The Men's A team of Matt, Brian, Landry, and Grome started easy up the first hill before ripping into the paceline. At mile 2, Matt dropped and Brian began to die. Three racers need to cross the line for the clock to stop in the A race, so they had to keep chugging along. Grome and Landry were the heroes of the race as they took monster pulls in order to give Brian some rest. They crossed the line 6th in 27:12 and not without a few tears and gasps for air from the third, struggling finisher. 26 degrees for the start of Day 2? No problem! The fourth and final race of the weekend was a circuit road race on the same course as the team time trial. Rafi and Jackson stayed close, working together in the 20 mile D race. The field began to split on the final climbs and Jackson hung on while Rafi had to pull due to a flat tire. Jackson finished 22th of 72, wrapping up his first race weekend and arguably the toughest weekend to date. Great work, Jackson! The Men's C race rolled out next. Matt, MJ, and Brian started the race tucked in the pack, trying to save energy for the hills. Halfway through the first lap, MJ's chain dropped right in front of Brian. They both stopped, fixed the bike, and tried to regroup with the main field. Unfortunately, they couldn't regain contact and pulled from the race. Matt, however, stayed strong and finished 18th in the race. Lexi took on the women's D race impressively after she was momentarily dropped mid race. She worked successfully to get back to the main field over the remainder of the course. Lexi placed 20th in her final race of the weekend! Landry, coming off a solid Day 1, tried to make his 50 mile B race difficult for everyone. 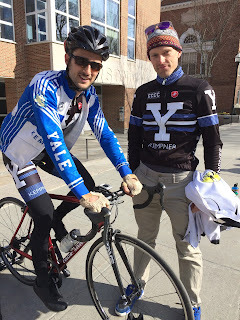 He and a guy from MIT did most of the work over the length of the course, but it sapped his legs for the final climb and sprint. Still good enough for an 8th place finish! Grome again ended the day with the A race. The 60 mile course saw a sizable breakaway in the first lap. Grome placed himself right in the middle of the break of 8 riders, but was unable to hold on to the swift pace. He dropped back to the peloton and rode a smart race with the rest of the riders. He crossed the line with the peloton. Next week, the Bulldogs travel to West Point for the Army Spring Classic. This will be the last race weekend before the ECCC championships at MIT, so stay tuned for the highlights as we push towards the end of the season!